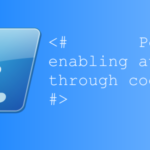 If you are looking to automate some of your work on SQL using PowerShell then below commands or syntax will be helpful in executing commands using PowerShell. Use SQLCMD.EXE, you need to install SQL management tools on your system, save the SQL query on the file system with .SQL extn and then call it using SQLCMD.exe command. $SQLQuery = "Select collation_name from sys.databases where name='$($Database)';"
$SqlConnection.ConnectionString = "Server = $($SQLServer); Database = $($Database); Integrated Security = False; User ID = $($Username); Password = $($Password);"